For many Christian animal advocates, the gift of presence, of being able to simply show up and be is a rare gift. At church gatherings, we are explaining why there isn't any meat on our plate or where exactly we get our protein. We are navigating the politics of the buffet table, or simply trying to remain calm in the face of an onslaught of insensitivity. At events hosted by animal advocates, we might be the only Christian, working to show that "not all Christians" are indifferent to suffering. Even in spaces where justice issues are front and center, animal issues are too often seen as insignificant. It's a tiring way to be in the world. One of CreatureKind's goals is to help strengthen the fast-growing community of Christian animal advocates. We can do that to a certain extent online, through our blog and Facebook page. But there's something special about being face-to-face with like-minded people. There's something special about being able to show up in a space to simply rest in the presence of God and not have to be "on." In early December, CreatureKind gathered a small group of Christian animal advocates from all walks of life for a weekend retreat at a spiritual center in Philadelphia, Pennsylvania. Through group dialogue, conversation partners, and individual reflection time, we traded stories of our experiences, sources of strength, and hopes for our future work. 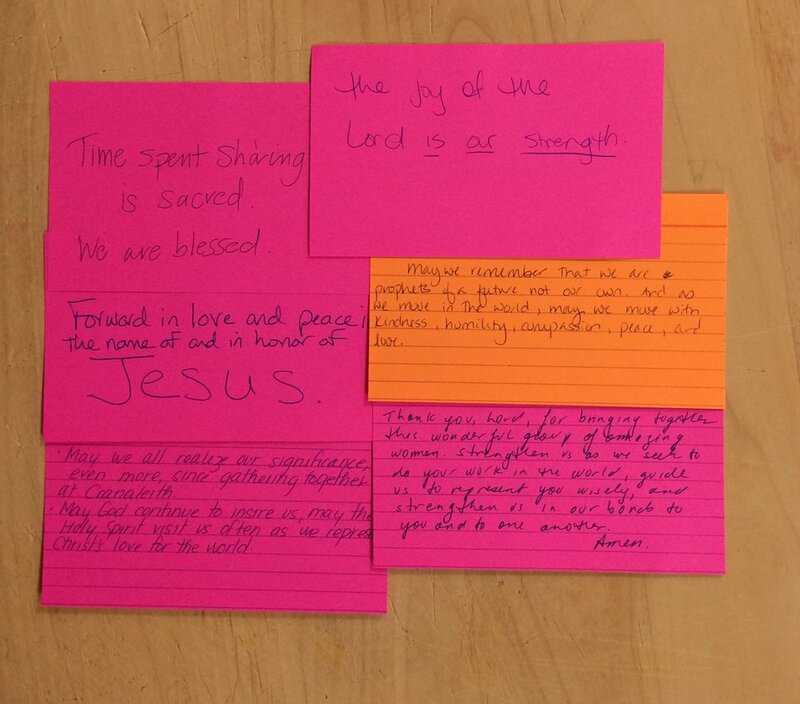 Some of the prayers and words of encouragement offered by retreat participants for the retreat group. One participant described the experience as "healing and inspiring." "It was extremely helpful for me to be in community with fellow veg Christians. I was deeply fed, my heart has healed and I have been inspired to press on..." said one retreat participant. Another commented, "I very much enjoyed and was encouraged by the simple presence of other vegan Christians! I do not have the opportunity to gather this way with people who are both rather than one or the other!" I know that I am finite. I know that the fate of the world does not rest in my hands (let's all pause to be grateful for that). And I know that it's important to take time to relax and recenter. But as a lifelong activist and recovering workaholic with the weight of All The World's Bad Things pressing on my heart and mind day after day, it is difficult for me to act on what I know to be true: my worth is not tied to my productivity. And real life, flesh-and-blood, face-to-face connection with other Jesus followers is critical to my spiritual and advocacy health. People came from all over the United States for this retreat, from coast to coast, north to south, by plane, train, and automobile. I believe this experience should be accessible for all, regardless of their ability to travel a great distance. If you're interested in bringing a CreatureKind retreat to your community, drop us a line. Let's figure out how to help ensure that Christian animal advocates in Orlando, Chattanooga, Denver, London, and beyond have the chance to gather with other like-minded Jesus followers, and to receive the gifts of presence and of being seen. And if you'd like to support CreatureKind's work to strengthen the growing community of Christian animal advocates, you can donate here. Peace. And many prayers that you are able to experience needed moments of connection with God, fellow creatures, and your own heart.